Solution combustion synthesis, a simple and efficient route was adopted to synthesize color tunable Ba3Y4O9: Eu3+ nanophosphor with varying composition of trivalent europium ions. Structural analysis using powder X-ray diffraction technique reveals trigonal crystal system belonging to hexagonal crystal family with R3 (143) space group and nanocrystalline nature of the synthesized phosphor. The average size of the synthesized phosphor in nano-scale range was confirmed by using Scherrer’s equation and transmission electron microscope (TEM) analysis. A structure refinement technique i.e. Rietveld refinement was employed over powder X-ray diffraction data that fits the entire powder pattern together with peak shapes and background. 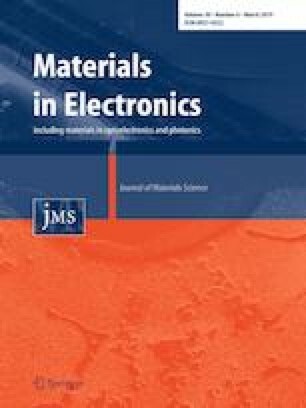 Photoluminescent features were analyzed via recording excitation (200–500 nm), emission profile (415–750 nm) and luminescence decay curves for optoelectronic applications. The emission spectrum shows characteristic intense peak at 615 nm by means of 5D0 → 7F2 electric dipole transition. Judd–Ofelt parameters for all concentration of Eu3+ doped system were determined by employing Judd–Ofelt theory. The optimum doping concentration of Eu3+ ions in Ba3Y4(1−x)O9: 4x Eu3+ was found to be x = 0.10. Moreover, the critical distance was computed to be 10.91 Å suggesting d–d interactions as a major reason for concentration quenching phenomenon. The energy band gap values for pure host lattice and optimized system were calculated as 5.41 eV and 5.91 eV respectively via Kubelka–Munk theory. CIE (Commission Internationale De I’eclairage) color coordinates lie in blue–white–red region depending upon the composition of dopant ion. The potential use of synthesized nanophosphor as a warm light source was evident from the correlated color temperature (CCT) result. One of the authors, Anju Hooda would like to thank the Council of Scientific and Industrial Research (CSIR), New Delhi, India for its financial support in the form of junior research fellowship (JRF) (Award No: 09/382(0195)/2017-EMR-I).